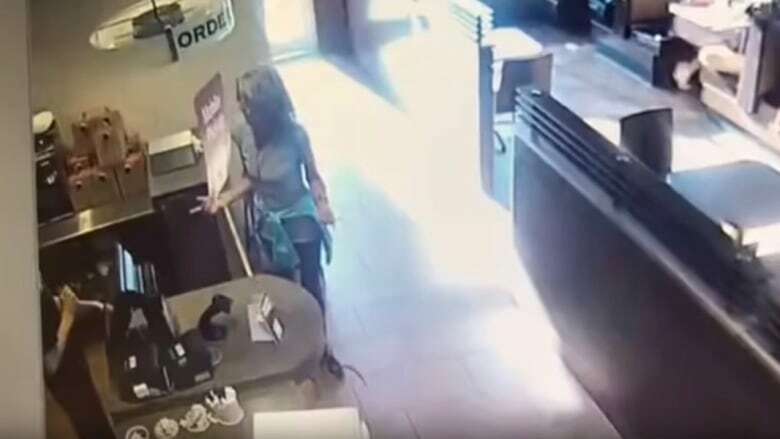 Langley RCMP say a local woman was briefly detained after an incident at a Tim Hortons restaurant that was caught on surveillance footage appears to show her arguing with staff, before defecating in front of the counter and throwing it at staff. The Tim Hortons corporation said it is "deeply concerned" about a graphic video circulating online that appears to show a woman argue with staff at a Langley restaurant, before defecating in front of the cashier's counter and throwing it at staff. According to Langley RCMP, the incident took place at the location in the 20200-block of Douglas Cr. on Monday evening. RCMP said officers briefly detained the woman, who is known to police in the area, and issued a date for her to appear in court. Police said nobody was injured in the incident, and a report was provided to Crown counsel, who will decide whether any charges will be filed. "In limited cases across the country, restaurants have a restricted access policy for restrooms to ensure the well-being of our guests," said Tim Hortons in a written statement. "Our current understanding is that the Team Member used their discretion in this case and denied access to this Guest based on past behaviour and out of concern for the immediate safety of Team Members and Guests in the Restaurant," the statement read, adding that as matters escalated, staff called police. Tim Hortons said the safety of staff and customers is a top priority and the corporation is working with the franchise owner to continue to look into the incident.